and from start to finish, our experienced staff is at your service. Winner of Emmy and Pro Sound News awards, plus other various music and variety awards, featured in articles in EQ and Film & Video magazines, mainland clients include: Disney, CBS, NBC, ABC Wild World of Sports, Warner Bros, Columbia, Paramount, and numerous musical performers and groups. Our 30 years of experience in Hollywood on sitcoms, dramas, documentaries, talk and variety shows help family and friends feel like they were actually at the wedding! a treasured family heirloom to be enjoyed forever. Each Love Story is produced using state-of-the-art digital technology and equipment, including non-linear editing. On-site expertise ensures that not one moment of this once-in-a-lifetime experience (both planned and spontaneous!) is missed. "I can't believe how many times the Groom will tell me he "can't believe how hard I work". I am flattered that he has noticed. Often photographers tell me that also. It is really great when people I am working for as well as the ones I am working with appreciate my hard work. I do my best to not only meet but to exceed all expectations with every wedding couple I work with. 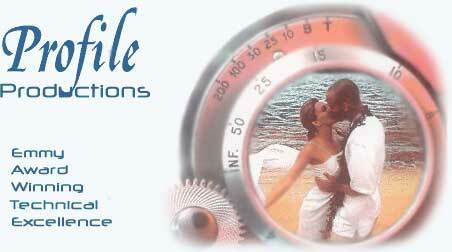 We have become the benchmark for all other wedding videographers because of the caliber of the work we do. Please take a few minutes and look at the sample video clips below as well as other clips throughout the site. CLICK HERE TO FIND OUT WHY YOU SHOULD CHOOSE A PROFESSIONAL TO MAKE YOUR VIDEO? VIDEO PACKAGES:We offer four packages to suit your needs. You may also add segments from our Extras page. It would be impossible to list ALL of the wedding services we offer. What follows is a brief summary of each package. If you have a particular request, please do not hesitate to contact us. This is our signature package. Twelve hours of camera coverage, covering, bride and groom getting ready, pre-ceremony, ceremony, beauty shots and reception. (Two cameras for six hours). Photo montage of 10 childhood and dating pictures. Photo montage of 10 of your favorite honeymoon pictures. Two cameras during the ceremony. Deluxe edited version of the complete event. Three completed videos delivered as Deluxe DVD with multiple feature menus and chapters. Three copies of "Our Wedding Day Highlights." This is an edited basic DVD for friends and casual watching (approximately 15 minutes long). Six hours of wedding day coverage, covering, bride and groom getting ready, pre-ceremony, ceremony, beauty shots and reception. (We recommend two cameras for three hours). Completed video delivered as Deluxe DVD with multiple feature menus and chapters. Three hours of wedding day coverage covering: pre-ceremony, ceremony, beauty shots and reception. Two cameras during the ceremony. (One camera for everything else). Photo montage of 6 childhood and dating pictures. Completed video delivered as one Deluxe DVD with feature menus and chapters. Completed video delivered as basic DVD approximately 20-25 minutes. This is the package we recommend to couples on a budget! It’s the basics: It includes: Prequel, ceremony, post-ceremony vignettes, romantic and dramatic recap set to multiple music tracks. for more information and prices on our packages. We will help to custom tailor the projects to your needs. The options below can help you with other ideas to add to your lifetime memory. Check out our Wedding Extras for additional ideas on how to personalize your wedding video. each 30 minutes of raw footage. ** Every wedding receives the same attention to quality, detail, uniqueness, and our commitment to reflect the personalities of the couple and the events of their wedding day, while providing an entertaining and romantic video. Because of that personal attention, we do not and will not rush the editing process. Please allow 8-16 weeks (or even longer) after the wedding for delivery of the video. All services are subject to Hawaii State Sales Tax and shipping charges.